From Saturday, May 13th to Sunday, May 14th, Valiant’s non-stop convention tour is going full speed ahead into Tidewater Comicon – and we’re bringing along a high tide of merchandise and panels for two full days of all-out action! All weekend long, join Valiant inside the Virginia Beach Convention Center at booth #1105 to see why the biggest independent superhero universe in comics is also the best with a selection of paperbacks and deluxe hardcovers for critically acclaimed and award-winning titles including BLOODSHOT REBORN, BRITANNIA, FAITH, HARBINGER RENEGADE, NINJAK, QUANTUM & WOODY, SAVAGE and many more! Plus, don’t miss the all-star Valiant talent that will be joining Tidewater Comicon through the weekend including Robert Venditti (writer, X-O MANOWAR; BOOK OF DEATH)! Then: Jump into the world of alien-armored Visigoths, machine-made soldiers, and high-flying heroines on Saturday, May 13th at 12:00 p.m. EST in room #5 for the VALIANT 101: THE STORY STARTS HERE panel presentation! New to the Valiant Universe? Jump on board right here with a concise and fun-filled introduction to the origins and adventures of Valiant’s greatest and most iconic heroes – from BLOODSHOT and DIVINITY to FAITH and HARBINGER RENEGADE to NINJAK and X-O MANOWAR! From The A.V. Club to Buzzfeed and Entertainment Weekly and dozens more, Valiant has been hailed as the premier superhero publisher in comics today… Now, look no further than this panel of Valiant all-stars to find out where to start! Plus: Get a sneak peek at the unbelievable battles and milestone moments that are heading to the Valiant Universe on Sunday, May 14th at 11:00 a.m. ET in room #5 for the VALIANT: THE ROAD TO HARBINGER WARS 2 panel presentation! The road to Valiant’s biggest, most ambitious and impactful comic book event of all time starts right here! Jump on board to find out what the future holds for HARBINGER RENEGADE, X-O MANOWAR, BLOODSHOT, FAITH, DIVINITY, NINJAK, and the rest of Valiant’s most powerful heroes… and how the coming of HARBINGER WARS 2 will soon be felt across the entire Valiant Universe! We’ll see you in Virginia Beach! 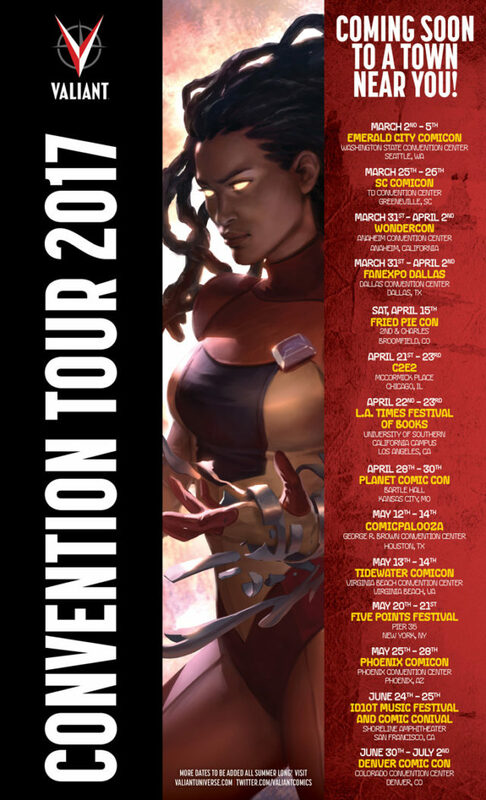 And make sure you’re there for every second of the action as Valiant’s one-of-a-kind convention road show marches on through New York, Phoenix, San Francisco, and more throughout the summer!